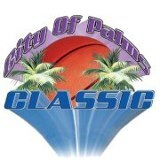 City of Palms, Jabari Parker, Recruiting is Hot! It's that hot time of the season again for Duke basketball recruiting, and Blue Devil Nation will be in the thick of things to bring our paying members all the latest from the trail. BDN Premium is our extended subscription service, which features a private message board and hands-on coverage of the basketball and football programs, both the recruiting and the actual team beat itself. To bring you timely and accurate inside information, we believe one has to be there, right in the middle of the action. And we are. Starting today, members will be treated to updates as they happen from the City of Palms Basketball Tournament, which is loaded with the nation's top prospects, including Jahlil Okafor, a center that Duke is very interested in. Okafor is a Chicago native, as is another name that is on the tip of everybodys tongue, Jabari Parker. The multi-talented forward from Simeon High will make his collegiate decision tomorrow afternoon, and there is more than a little buzz surrounding his commitment. Members can get BDN's collective thoughts on the matter. And our opinions should count for something, for as a BDN Team we've had numerous interviews with Parker (which you can see in our archives) and more in-person opportunities to watch him play than we can count. With the holiday season coming up, give the gift of BDN Premium or just give it to yourself and join a site that will give you one of the most Duke-centric experiences you can get. Our football recruiting and team coverage is second to none. It's the best kept secret out there thanks to the dedication of our staff. Our basketball coverage speaks for itself. But no worries if you just want to visit Blue Devil Nation, for we will always have free offerings which include game previews and rapid reactions to all of the games we attend. It's an exciting time to be a Blue Devil fan, and we love what we do. Our staff of Patrick Cacchio, Andrew Slater, Tom Rubinson, Bob Green, Varand Khachadouri, Travis Boyd and our awesome team of moderators in Brad Jenks, Jay Dennis and Terry Rains, and of course our Admin, Susan Rego, all invite you to become a member today. And to lighten the load on you, we are offering a 20% discount across the board on all memberships, be they monthly or yearly, which is by far the best value. Once you have joined, we'll send you the 20% discount back through Paypal. So if you join for one year at $100.00, as soon as your Paypal payment clears, we'll send you 20 bucks back. It adds up to just a few cents a day to unlock full site access and to stay informed on everything involving the Blue Devils. See you on the inside! 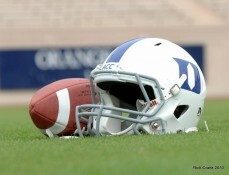 Duke Football received a commitment from quarterback prospect Tyler Douglas on Friday, making him the 13th player in the class of 2013 to verbally pledge to the Blue Devils. Douglas, who hails from Ft. Myers, FL, is also listed as a WR on many boards. He is currently listed at 6'2", 190 lbs. and has been timed at 4.5 in the 40-yard dash. Douglas threw for over 1200 yards for the Green Wave last year, and was a part of 13 touchdowns. Duke Head Coach David Cutcliffe has built a reputation of producing NFL quarterbacks throughout his career. In truth, his offenses have produced nearly as many NFL running backs, including players like Jamal Lewis, Deuce McAllister and Arian Foster. This fall, the Blue Devils should feature one of their deepest backfields in recent years, headlined by senior Desmond Scott along with last year’s leading rusher Juwan Thompson and speedy redshirt-sophomore Josh Snead. They will be joined by two outstanding freshmen in Jela Duncan and Shaquille Powell. Duke’s running backs are utilized in all areas of their offense – rushing, receiving, and blocking. Looking ahead to the class of 2013, the Blue Devils are looking to add to their running back stable, and have expressed a strong interest in Bo Ellis, a powerful back out of Gulliver Prep in Miami, Florida. 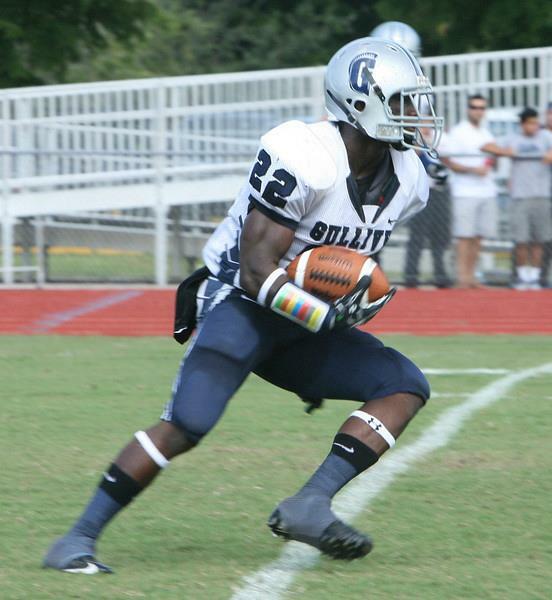 Ellis is a 5'8" 185 pound prospect who finished his junior year with over 1300 rushing yards and 10 touchdowns. The son of a former Miami Hurricane, Ellis is no stranger to ACC football, and he has the talent to become the next great Blue Devil from Gulliver Prep to play for Coach Cutcliffe. Probably my greatest strength would be my vision, because I can find the holes when they’re not there. We study the film so much, me and my quarterback, we study the film so much that we know the weaknesses of the defense and I know exactly what I need to do on a certain play. I’m running track this spring, trying to get faster. Working on spring workouts, and working on watching film from last year because most of the teams we played were filled with juniors, so it will basically be the same team that we’ll play this year. The balance between academics and athletics. I want to make sure I get a good academic foundation as well as being at a school that’s used to winning. I have offers right now from Boston College, Temple, and Bowling Green. Duke has been talking to me a lot, Duke and Purdue, and West Virginia, and Kansas State. I haven’t yet, I’m probably going to start doing that in the summer. BDN: Are there any schools that you definitely plan to visit this summer? Boston College and Duke, I’m for sure going to go to, as of right now. BDN: How much do you know about Boston College and Duke, and how interested are you in those two schools? Boston College just got a new offensive coordinator, I think it’s from Kent State, and they’re running a new offense there, I know the running back they had there a few years ago was pretty good. Duke, Coach Cutcliffe from Duke, he’s very good. He mostly has worked with quarterbacks, but he does really good things with running backs too. BDN: You’ve had a couple players from your school who have had very good careers for Coach Cutcliffe at Duke. Yeah, Conner Vernon and Donovan Varner. It will probably be after the season, right after the season. BDN: Thanks a lot, Bo, and best of luck. With this year's graduation of All-ACC safety Matt Daniels along with CB Johnny Williams, and with the impending departures of seniors Walt Canty, Jordon Byas, Lee Butler, and Tony Foster, it's safe to say that the Blue Devils will be looking to reload their secondary in the class of 2013. They're already off to a great start with the commitments of Evrett Edwards, Quay Mann, and Jake Kite, but a few other players remain near the top of Duke's recruiting wish list. One such player is Malik Rucker, a 5'11" 175 pound defensive back from New Hope, Minnesota. The Blue Devils are not alone in pursuit of the talented athlete, as Rucker has already racked up 17 offers so far this spring. BDN caught up with the talented defensive back to get an update on his recruitment and his relationship with Duke. As a player, I think I bring a lot of energy to the team. I feel like I play hard and that helps other players around me play hard. I’m a leader on the field and I think I’m good at running the alleys and getting to the ball, I have a nose for the ball. I think that’s what my strengths are as a defensive back, getting to the ball and running the alleys. I’ve been working on a lot of little things like my footwork. I think I have pretty good footwork now, but I’m just working at getting it better, just attacking the ball, getting out of my breaks better and a lot of the smaller things. When I go to the colleges, I like to see the atmosphere, I don’t get to see the atmosphere every time, but I think that’s going to be a big part of my decision; the atmosphere of the school, the people, and the academic support. I want to have a good defensive back that I get along with, because I’m going to be with him a lot, so I want a great defensive back coach that I feel comfortable around, not just the recruiter for my area. I think I have 17 offers. From the schools that have offered, I’m in contact with all of them, basically, I try to talk to them as much as I can, try to get a call to them at least once a week, I’m in good contact with every school. The schools that I’ve been hearing from the most that haven’t offered is probably Penn State, Cal, Pitt, and Arizona and UCLA. BDN: You have schools all over the country recruiting you; is location an important factor to you or do you see yourself going anywhere? I see myself going anywhere at this point. BDN: Which schools have you had a chance to visit and which schools do you plan to visit this spring or summer? I’ve been to Nebraska was my first visit of the spring, I got out to their spring practice. I’ve been to Minnesota, I’ve been over there a few times. Iowa and Iowa State, I went there. I went to Buffalo to see their practices and just this last week I went to NDSU and I stopped by UND for their spring game too. And I’m going to Kansas on Saturday. BDN: Are there any schools that you have offers from that you plan to visit this summer or fall? I’m not really sure because some of these schools that I have offers from are pretty far, so I have to figure out that. I want to get to every school that has offered me to see what they have to offer as a campus, their facilities, and their coaches, see how they act around me. BDN: You mentioned the importance of your relationship with the defensive backs coach; are there any coaches that you have a close relationship with at this point? I’ve been telling a lot of the schools that, so a lot of the coaches, I end up talking to a lot of the coaches, but I think I have a good relationship with Iowa State, Iowa, Coach Campo from Kansas, Coach Jones from Duke, and Coach Petercuskie from NC State. So a few of the schools that have offered I feel comfortable around them. I think I’ll make my decision when I feel the most comfortable and when it gets around the time to take my official visits, that’s when I’ll come up with a top 5. BDN: So you plan to have a top 5 and take your official visits and then make your decision this fall? BDN: Thanks a lot, Malik, and best of luck. 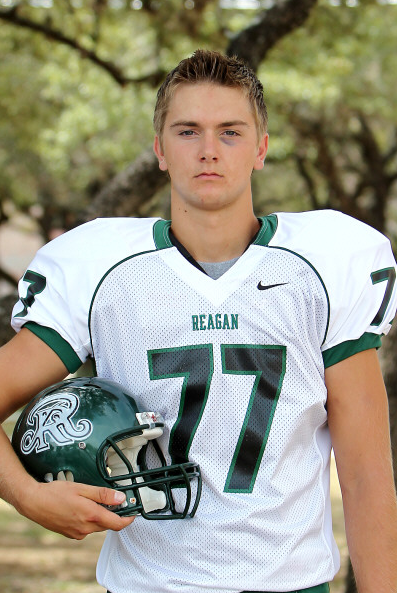 Back in March, BDN first introduced Duke fans to Sterling Korona, a 6'7" 250 pound offensive lineman from Ronald Reagan HS in San Antonio, Texas. Since then, he's seen his recruitment take off this spring, as schools from across the country have joined Duke in pursuit of the big lineman. The Blue Devils were able to host Korona on an unofficial visit in Durham last weekend, where they confirmed a verbal scholarship offer to the talented prospect. Offensive Line Coach Latina, who has produced multiple NFL linemen throughout his coaching career, already has two Texas linemen added to the program in 2012 signee Tanner Stone and 2013 commit Austin Davis. The Blue Devils would love to keep that Texas pipeline flowing, and made a strong impression on Korona last weekend. BDN: Where do you stand with verbal scholarship offers and interest from schools? 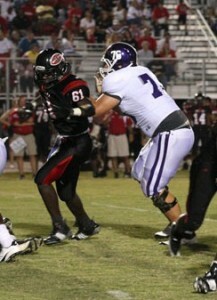 I have received verbal offers from several schools. I did receive an offer from Duke during my visit last week. 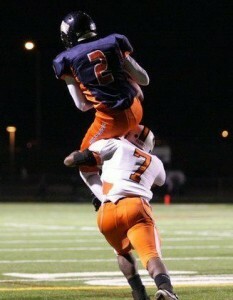 I have offers from schools in the PAC12, ACC, Big East, CUSA and WAC. I have been in communication with 3 Big 12 schools and a Mountain West school. BDN: What schools have you visited so far? Have any coaches visited you this spring? We actually only started to visit schools in the past couple of weeks, so far I have visited UTSA, University of Houston and Duke. We are in our first week of Spring Ball and I have had visits from TCU, Tulsa and Washington State so far. BDN: How was your visit to Duke? What did you like or not like? Duke is a special place. Coach Cutcliffe, Coach Roper, Coach Latina, the support staff and Alumni are rebuilding something special. Duke has great tradition and history and it would be a great privilege to be a part of that. The educational opportunities are incredible and the support for athletes as students is very good. There really was nothing that I didn't like, it was a great visit. BDN: Do you have any other visits planned or in the works for this spring or summer? We do have other visits planned for May and June. I am scheduling visits to Washington State and Tulsa right now and there are a few others that are in the works. BDN: Have any schools stood out to you, either on a visit or because of your interaction with the coaching staff? That’s a really hard question to answer. The process has made me aware of so many good schools and programs. Each has its strengths and advantages. Like I mentioned before, Duke is a special place and you just feel it when you walk around the campus. I have spoken to so many good coaches and people over the last few months it would take me a book to tell you everything that has stood out. I am so excited about having the opportunity to play at the next level and be considered by such good programs I am just trying to soak it all in. BDN: When we last spoke, you mentioned planning to wait to evaluate all your options and making a decision near Signing Day. Is that still your timeline? No, I don't think I am going to take that long to make a decision. The timeline my family and I are looking at would have me making visits in May and June and Committing some time this summer. The reason being, I have not forgot that right now and for the next year, I am a Ronald Reagan HS Rattler. Coach David Wetzel and the other coaches here are awesome and I want to go into my senior season focused on winning a 5A Texas State Championship. I think that having already made a commitment will help me relax and concentrate on having a great senior year and becoming a better player and student.